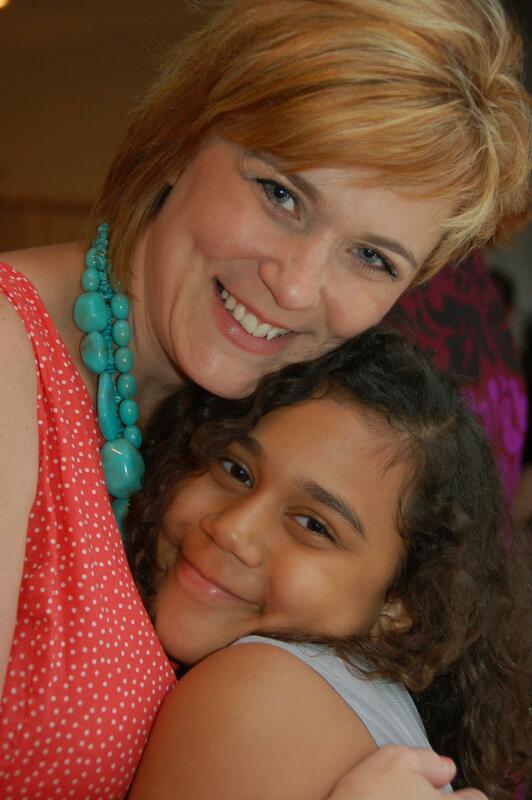 The summer of her 9th birthday, my daughter Julia met Maya. The birthday party where Julia met her best friend Maya. Julia is in the brown dress on the far right (hand at her chin). Maya is the young lady in the middle of the back row, wearing a floppy hat (without the black bow). Julia and Maya were introduced to each other at the birthday party of a mutual friend. 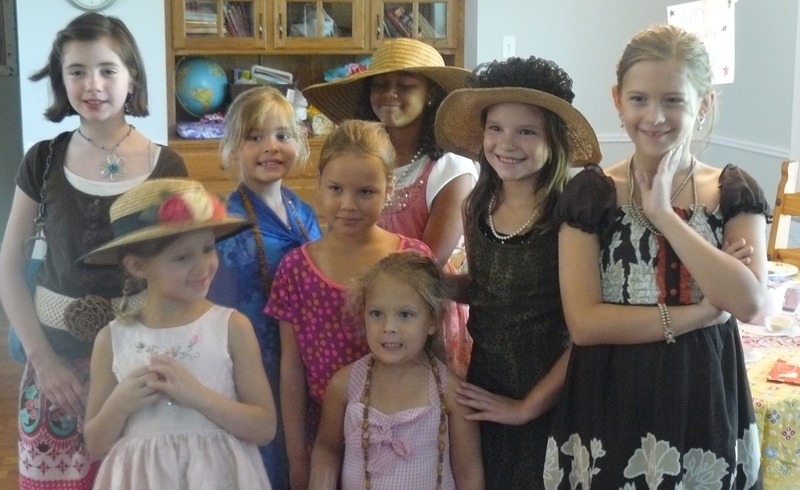 It was a dress-up tea party, and the birthday girl’s mom had asked me to stay and help her with party games. I was pleased to help, and enjoyed gazing about the room filled with giddy girls, each one dressed in her fanciest clothes, some wearing high heels, big baubles, long gloves, or floppy hats. Throughout the party, I noticed Julia and Maya, talking and laughing together just as if they had been friends forever. “That’s odd,” I thought. But I shrugged it off as Julia has always been a rather extroverted child who never meets a stranger. Once, during the middle of the party, Julia came over and whispered in my ear, “Momma, you won’t believe it! I have just met my best friend in the whole world!” Looking over at the cute girl with the adorable curls and infectious laugh, I thought it was sweet that Julia felt such an instant kinship to Maya, but then I also figured my daughter was likely being her normally over-dramatic self. “Maybe it’s not just Julia …,” I thought. The problem was that I didn’t know Maya’s mother at all. I felt uncomfortable picking up the phone and calling up a complete stranger to ask if our daughters, who were supposedly best friends, could get together and play. Questions raced through my mind. “What if Maya has forgotten all about Julia? Maybe her mother will be freaked out by a stranger calling to see if her child can come over to play?” Not wanting to put myself into an awkward situation, I typically just brushed Julia off, hoping that eventually she would forget all about Maya and find another best friend. Six months later, my daughter Megan wanted to have a sewing party. 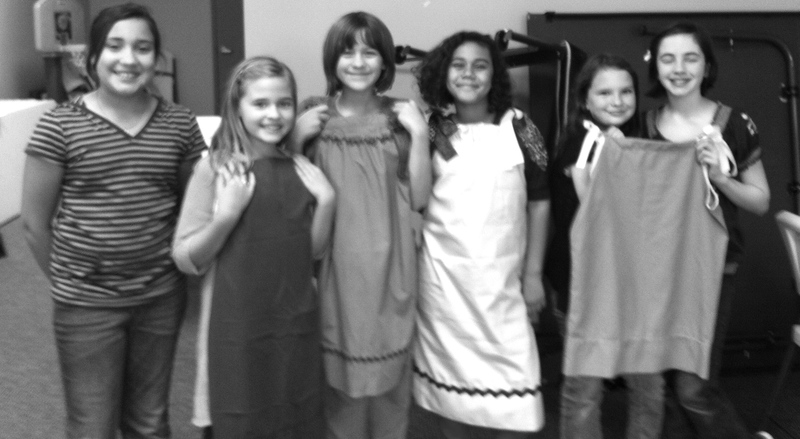 The plan was to make pillowcase dresses to send to an organization called Little Dresses for Africa. Since it was Megan’s party, most of the girls invited to come were her friends. However, Julia asked (rather insistently) if she could invite a friend as well … and, as I’m quite sure you’ve already guessed, Julia wanted to invited her best friend in the entire world, Maya. Finally, I could relent! Calling up a mother with a party invitation for a child is so much easier than calling up for no reason.To my great relief, Maya’s mom, Misty, was not only friendly and easy to chat with, but also pleased to accept the invitation for her daughter. “That was easy,” I thought, as I hung up the phone. “I really should have called Misty sooner.” But at least now I could rest easier knowing that I had finally worked it out for Julia to see her “best friend” again. I just hoped with all of my heart that Maya still felt the same way about Julia. I hated to think that Julia’s heart might be broken. Thankfully, on party day, Julia and Maya seemed to pick up right where they left off six months earlier. Even I had to admit these two girls had something special. The sewing party attendees … Julia and Maya are together in the center. Since the sewing party, hardly a week has gone by without Julia and Maya seeing each other. They are in the same 4-H club, on the same swim team, and beg for sleepovers constantly. In fact, earlier this month, Julia and Maya went to Teen Pact. The only way either one of them would consent to go was if the other one was going too. These two girls are a matched set, like salt and pepper, ham and cheese, peanut butter and jelly. Wherever you see Julia, you are going to see Maya too. 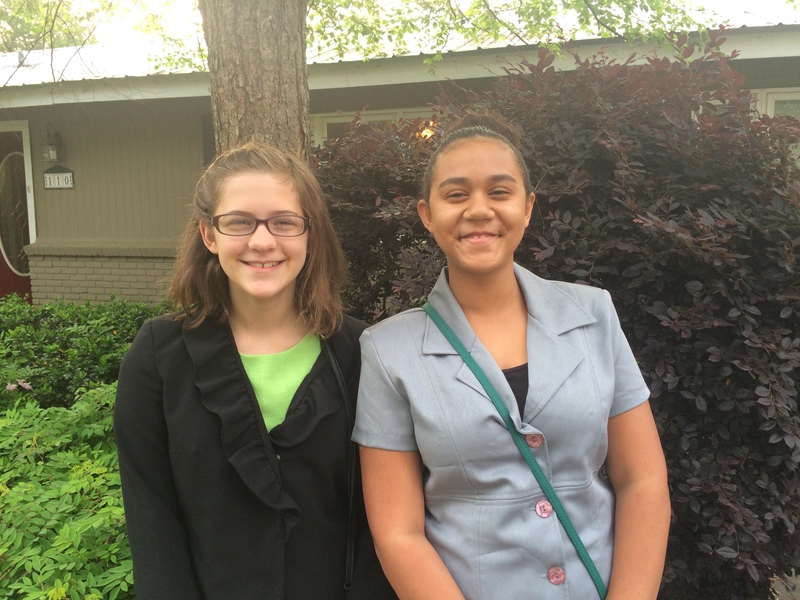 Julia and Maya, all dressed up for Teen Pact. But what surprises me even more than seeing how Julia and Maya met and became instant friends, was discovering God had a friendship for me in this as well. When I moved to Cajun Country four years ago, I left behind friends and came to a place where I knew just a handful of people. For a long time, life in Lafayette was lonely. I was grateful for my husband, who really is my best friend, but sometimes I just wanted another woman to talk with and relate to … a friend in this new town I was learning to call home. To my unexpected delight, Misty has turned out to be one of several answers to that prayer. She’s the sort of friend who can walk right into my home unannounced, wipe up my dirty countertops, and make a pot of coffee without ever thinking twice about asking. Misty has more than once talked to my daughter just as if she was her own child, calling her out on rotten attitudes or bad thinking. She’s the kind of friend who I can call if I have a problem or need some prayers. I never dreamed when Julia met Maya, that God had planned all along to give me a good friend too. A good friend is a blessing from God. Next Article No Naps: Not Now, Not Ever … Never! What a neat story, and what a cool way for God to bring this friend into your life! Thanks for sharing! It really was a special surprise sort of friendship … and I’m really blessed by both Maya and Misty.